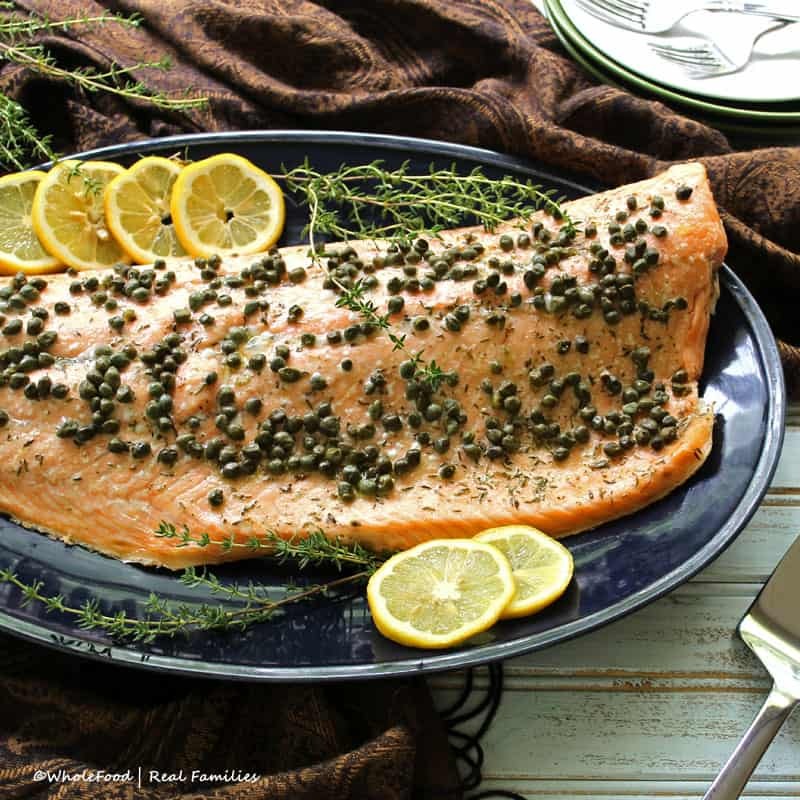 Roasted Salmon with Capers is elegant enough for dinner guests. But simple enough for a weekday meal. It takes less than 5 minutes from prep to oven. 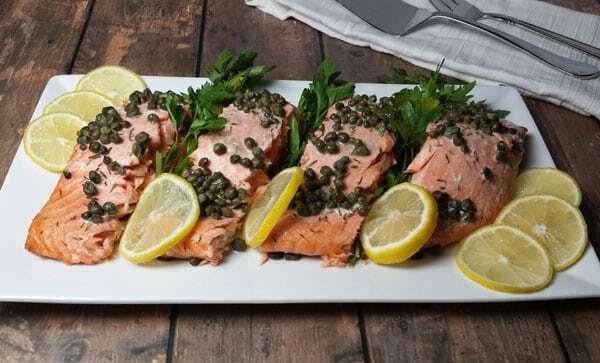 It really doesn’t matter how many different ways I make salmon, the result is always the same: “That was really good – but next time can you make the one with the little capers?” Yes, next time I will make the salmon with the capers. I shouldn’t complain. It is the absolute easiest recipe in my kitchen. It takes about 3 minutes to put the whole thing in the oven. My oldest child was raised on this recipe… for the longest time, it was literally the only fish she would eat. We are from the south so I grew up on my mom making salmon patties for dinner with mashed potatoes and black eyed peas. All three of my kids love them but were shocked to find out there was actual fish in there. (Something about grandma’s making food makes it taste better I think!) But once we got the blessing (and assurance) of my mother that this was the same fish she used (except her salmon comes from a can – don’t judge if you haven’t tried it! It is delicious!) my kids eventually moved to trying, then tolerating, then begging for salmon with capers. To make things even easier, I have to confess something – I cover my sheet pan with foil and just toss it during clean up. I feel the need to defend myself a little because of my wasteful admission. Once upon a time, a mom (me!) roasted salmon on a sheet pan with no foil lining. The next day she used the same pan to bake some chicken fingers, which tasted like salmon. After soaking the pan and scrubbing harshly, the mom roasted potatoes on the sheet pan, which tasted like salmon. After soaking in vinegar, which was the mom’s tried and true way of removing the stink from anything stinky in the kitchen, she scrubbed the pan again. Later that week, the mom made cookies as a special treat, which tasted like salmon. The mom was annoyed. The mom threw her stupid salmon pan in the trash can. The mom bought herself a new sheet pan and some foil. The end. So in defense of sheet pans everywhere, line your pan with foil. Fish is delicious. But not on cookies. Just sayin’. 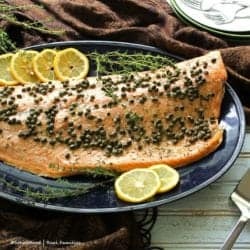 To season this salmon recipe, it uses literally good salt, pepper if you like it, a little thyme, and a jar of capers. That’s it. The good salt is a big deal though. Spring for the kosher salt or better. Regular iodized salt tastes a little like chemicals to me and the fish seems to soak it up. Where kosher salt tastes… minerally… is that a word?? If you have never tried it, taste iodized salt and kosher salt side by side. You’ll never go back. You are going to bake the salmon at 425 degrees for around 20 minutes. But the time depends on how well-done you like your fish and how thick the filet is cut. Roasted Salmon is so simple – We eat it LOTS! 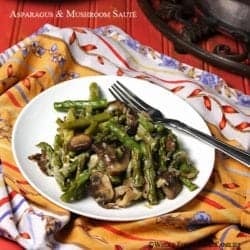 I usually serve Roasted Salmon with Capers with Herbed Brown Rice and this Asparagus and Mushroom Saute. I like the earthy flavors with the salmon. Each taste seems to make the others better. I generally purchase wild-caught Alaskan salmon as opposed to farm raised salmon. Follow this link if you are interested in the differences between wild caught and farmed fish. If you have always just bought what was at the grocery store and need a guide for more carefully considering your seafood purchases, follow this link for a buying guide. It includes a list of questions to ask to make sure you are spending wisely and choosing the most nutritious options. 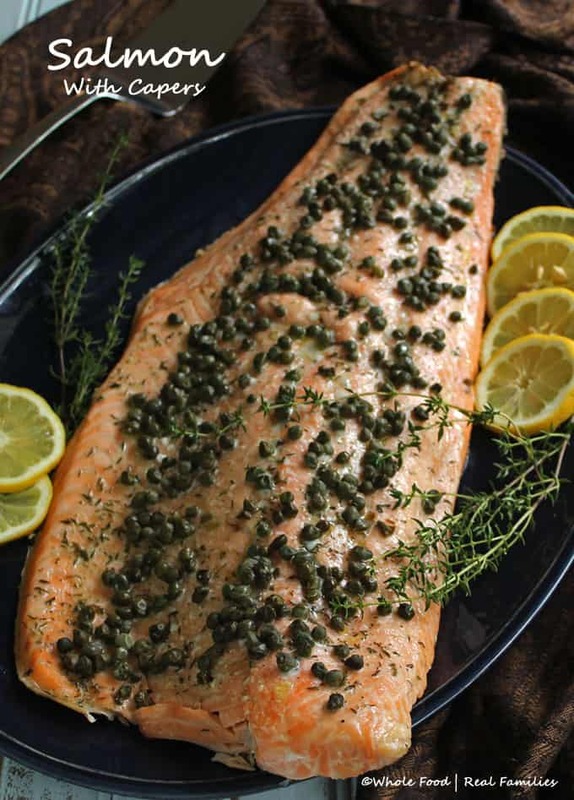 When I am out of capers, I can always find honey and mustard in my pantry and this Honey Mustard Salmon is a close second choice for our family. My kids like the honey… I like the mustard. So we’re all happy. We also really dig salmon and shrimp together! We live by the coast so the shrimp is always fresh here. And they both cook so fast it makes for an awesome weeknight dinner on the grill! Try this new salmon and shrimp recipe and let me know what you think! Roasting time will vary slightly based on the thickness of your filet. Slide a knife into the thickest part of the salmon to check if it is done. Cooked salmon will flake. Though many people prefer salmon to be medium rare, my kids freak out if they think it is rare in the middle so we cook it to medium. Preheat oven to 425 degrees. Place your oven rack at the top third of the oven. Line your baking sheet with foil. Lay your filet of salmon on the baking sheet. If your salmon still has the skin, lay it skin side down. Brush salmon filet with olive oil. Sprinkle with salt, pepper, and thyme. Drain capers and place them on top of the filet of salmon, some will roll off but stack them on top as well as you can. Loosely cover with a second piece of foil and place in the oven. Slice the salmon across to serve. If you feel wasteful about the foil, you can try parchment paper from the brand if you care. Its compostable which always makes me feel better about my green footprint! I compost so much stuff around my house because why not! 🙂 I hope you find this helpful! This recipe looks delicious. I think I will add lemon zest because I have some laying around. That is one beautiful fish. This is how we love salmon too and I offer no excuses for using the foil. Sometimes a girl has to do what a girl has to do!